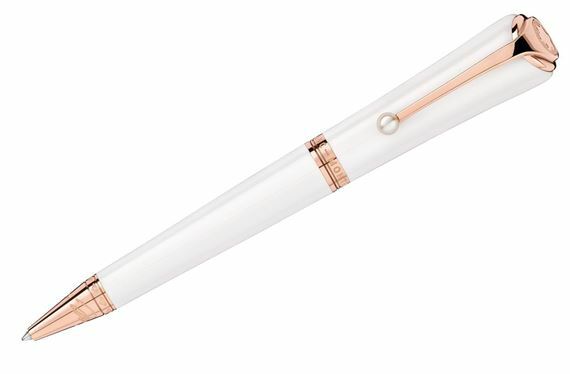 Order your Montblanc Muses Marilyn Monroe Pearl Ballpoint Pen today from FahrneysPens.com. Fine Pens, Refills & Luxurious Gifts – great prices & fast shipping. Marilyn Monroe (1926 -1962) has been celebrated the world over for her talents as an actress, sensual beauty and inspiration for active feminism. The Muses Marilyn Monroe Special Edition includes a fountain pen, rollerball and a ballpoint pen made of white precious resin - a nod to her famous white dresses. The design is inspired by Marilyn’s high heel shoes; the pearl on the clip recalls her love of pearls. 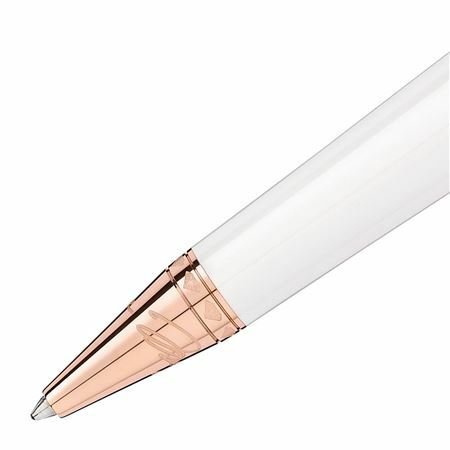 Rose gold-coated fittings include the cone engraved with her signature. Marilyn’s portrait is engraved on the 14K gold nib. The Marilyn Monroe Special Edition also features a notebook crafted in fine white Saffiano leather with ‘pearls’ design, as well as pretty pink Ladies Edition bottle ink, ink cartridges, rollerball and ballpoint pen refills.